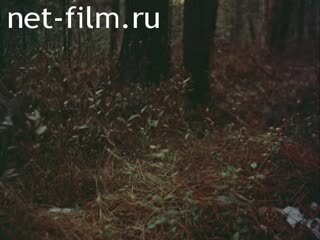 A story about everyday life of a hunter in the forest. 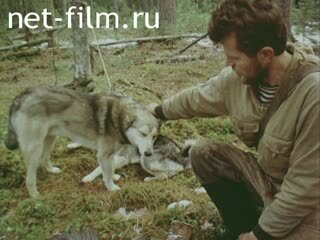 The film includes shooting autumn and winter hunting, home life and game wardens V. N. Sidorkin, his interview with the writer V. P. Astafiev. No 5-th part. The snow on the branches. Hunter's house. V. N. Sidorkin V. P. Astafiev. The stove is a fire. V. P. Astafiev. V. N. Sidorkin repairing boots and talks about her life. Hunter's house. V. P. Astafiev. Says V. N. Sidorkin. V. P. Astafyev writes. Clothes and shoes on the wall. Hunter goes to the woods. The alternation of natural panoramas, the people in the helicopter. The helicopter drops off the hunter, cutting down and away. Snow-covered spruce. V. N. Sidorkin dogs goes to the house. The hunter ties the dog and goes into the house. Dog. V. N. Sidorkin kindles a fire in the stove. The view from the doors in the twilight. Hunter breaks the ice and getting water. The icons on the shelf, the shadows on the walls. V. N. Sidorkin fills the cartridges. Astaf'ev V. P.-soldier, writer, Hero of Socialist Labor. Sidorkin V. N. - Ranger-game wardens, inspector Rosprirodnadzor, the head of the Yenisei district of Krasnoyarsk region (1996-2005), honorary worker of General education of the Russian Federation. The moon in the night sky. V. N. Sidorkin. Clouds over the forest (shooting from helicopter). Fallen leaves in the grass. Alternating: the deer, the dog searches for the track. Autumn hunting birds and small fur-bearing animals. A hunter with a dog to cross the river. Return home with the loot. The branches of the trees, the river flows. Owl in the fir-tree branches. V. N. Sidorkin. Bird of prey sitting on the ground. A fire near the house (view from hills). V. N. Sidorkin talking on the radio. Equipment and bags on the wall. The moon behind the trees. Alternating a hunter in the house, wolves in the woods. From the shots with firs showered snow. The trunks of the trees. A hunter with a dog in the woods. Hunter robs dogs of prey. The lamp in the window, reflected in the glass. The dog near the house. Alternating: the dressing of hides, hunting dogs. The dog lies under the porch. Spanning the river, trees, snow. V. N. Sidorkin configures the receiver. On the wall are dried sable skins. The moon behind the trees. V. N. Sidorkin extinguishes the lamp. The smoke and haze of fire on a background of trees. V. N. Sidorkin. August coup, the attack of the White House. The woodpile under the carport. V. N. Sidorkin goes on the hunt. The sun in the forest. The hunter shoots and goes to retrieve the loot. Sidorkin V. N. with the dog in the woods, a winter hunt. The dog barks on a leash. A hunter petting a dog. The stove is a fire. The chainsaw cuts through the wall. Dog. V. N. Sidorkin makes and installs the chimney pipe. Crossing the river under the snow. The dead bear. V. N. Sidorkin. The hunters killed the bear. Panorama of the forest, the clouds above the trees. The snow on the branch. The view from the door. V. N. Sidorkin goes through the woods on skis. Hunter with dogs goes deep into the thicket. Alternating: the hunter cuts off the twigs, dogs trying to dig up animal hole. V. N. Sidorkin campfire in camp. Hunter with dog in winter forest. V. N. Sidorkin chopping dead wood. Hunter cuts a fallen tree into pieces. V. N. Sidorkin puts the skis to the wall. Hunter lights a lamp and radio sets. The lamp on the windowsill. Alternation: V. N.Sidorkin at home and on the hunt. Hunter in the forest at dusk. The alternation of light of the lamp, V. N.Sidorkin soared in the bath. Hunter goes out of the bath and pounded with snow. Light bulb (out of focus). The snow on the branches, the sun is shining. Hunter goes through the woods on a snowmobile. The snowmobile in the Parking lot. V. N. Sidorkin saws a fallen tree on the trail. The hunter removes from the path of the pieces of the barrel. The movement of the snowmobile, dog runs after me. 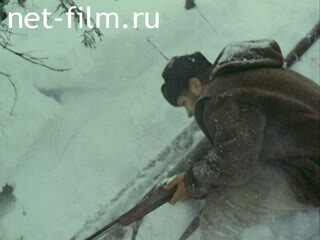 Alternating: the hunter at the bear's den, winter forest. The pot with the snow over the fire. V. N. Sidorkin. By means of a lever hunter pulls a bear out of the den. Hunter shakes and warms his hands over the fire. Movement in the woods on a snowmobile. The trunks of pine trees. Hunter campfire with a flare in hand. The landing of the helicopter. The technique for clearing, storms of snow. V. N. Sidorkin dogs in the helicopter. The view from the helicopter on the taiga through the clouds. V. P. Astafiev. Hunter goes skiing on virgin snow (shooting from the air). The sun over the forest.